According to a recent study of online physician reviews, 96% of patient complaints are customer service–related issues such as billing, inadequate communication, and disorganized operations. In today's evolving health care marketplace, patient choice is determining where and how individuals select primary and specialty care. As a result, practices must adopt a more consumer-focused approach in order to thrive. Factor in the burden of satisfying meaningful use requirements and the strenuous uphill climb for practices becomes very clear. With daunting amounts of partially handwritten, partially typed documentation, moving from paper-based records can become a massive task that quickly creates headaches for administrators working to identify the best solution, train personnel, and create a culture that thinks and works digitally. Even when practices move to an EHR, there often remains myriad existing patient documents, forms, and paperwork that must be completed by hand and filed in paper folders. This leads to an even more complicated process that reduces or, in some cases, eliminates the full benefits gained from moving to an EHR. The results can be costly to health care practitioners both in terms of lost productivity and revenue. Paper records must be managed and stored, taking up needed space in offices or costing thousands of dollars in storage facility fees. When needed, patient charts and data must be found and retrieved by office personnel, taking valuable time away from patient concerns. Lost or misplaced documents can impact costs and not having health information readily available can be detrimental to providing quality patient care. Providers are under increasing pressure, not only from budget constraints but also from swells of new patients as millions of Americans now participate in the health care system via the Affordable Care Act. Technology is crucial to sustain this growing demand, but practices can face significant challenges when they don't have all the information needed to make the smartest decisions. Despite the mandate that all health care providers implement EHR technology or face the punitive measures that were put in place to incentivize adoption, only 56% of all office-based physicians had demonstrated meaningful use of certified HIT at the close of 2015. While there are obvious benefits to adoption, many practices are holding out because they lack a familiarity with digital technology, legacy documentation slows adoption, and costs can be restrictive. In a world of constantly changing technology, it's easy for administrators to become overwhelmed by these issues, especially when practices have already dealt with an EHR that overpromised and underdelivered. However, it's important that practices understand the EHR's full implications and realize its potential to improve patient care, boost return on investment, and increase business process efficiency with the correct integrations. • Improved data accessibility translated to fewer delays searching for information, shorter patient wait times, and more time for physicians to focus on patient care. • The risk of errors occurring when reading or trying to comprehend handwritten notes was eliminated. • Communication and collaboration between different providers became easier and more effective. • There were more opportunities to improve preventive care. • Staff members were spending as much as 20 hours per week searching for and retrieving paper records. 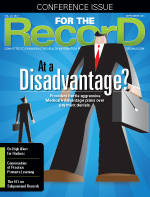 • MHCD was paying nearly $1,300 per month to house more than 25 years of records offsite. • The unending paperwork was encroaching on needed space, wasting the time of both staff and physicians, and inhibiting the benefits of EHR implementation. • easing the center's burden to meet HIPAA standards. Eventually, MHCD selected a technology that could scan all existing and new paper-based documentation to securely store and manage electronic records. • simplify its ability to maintain strict observance to HIPAA regulations, including the ability to protect patient health information, guard against unauthorized access to records, enable audit tracking of all uses of protected health information, and streamline the exchange of information between providers. Most significantly, an independent analysis of the technology's value by Nucleus Research demonstrated a return on investment of 1,315%, with an annual total cost savings of more than $250,000. But beyond the financial implications, the practice was able to stop wasting time on paper shuffling and get back to the important business of patient care. As providers navigate the changing health care landscape, identifying and implementing long-term technology solutions that decrease costs while enhancing patient care has become paramount to success. No longer relegated just to the administrative office, business concerns of hospitals and private practices are now the responsibility of everyone involved in patient care. — HK Bain is president and CEO of Digitech Systems, a provider of content capturing and management products.